Nine-year-old Audrey hurries to catch the streetcar. It’s 1935 in Toronto; the board game Monopoly has just hit store shelves, the first all-talking version of A Christmas Carol is in theatres, and in Memphis, Elvis Presley has just been born. Catching the streetcar, Audrey pays 3 cents for her ride, making the short trip to her piano lesson alone. Audrey has been playing the piano for over 80 years. 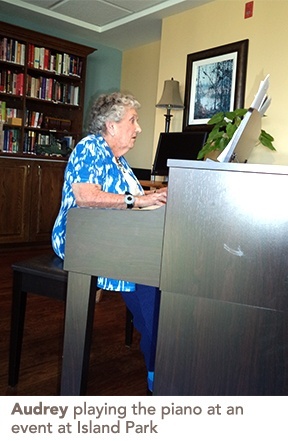 Today, her musical talents are well known at Island Park Retirement Residence in Campbellford, where she lives. It all started when Krista Hazlewood, lifestyle consultant at Island Park, asked residents what they would like to do if they had their life to live over again. “I said, ‘Krista, I don't even own a piano,’” Audrey said, explaining that she had given her daughter her piano before moving into Island Park. Krista told Audrey she could practice on the piano in the lounge, but Audrey didn’t like the idea of practicing in front of everyone she lived with. She told her family about her conversation with Krista, and a few weeks later her son, Bob, surprised her with a trip to Peterborough to buy a new keyboard for her room. That was four years ago, and Audrey had been playing the piano for her neighbours ever since. Audrey loved to play jazzy songs, but sticks to old classics for her performances at Island Park. One song in particular, Star Dust, is a song she played as a child in music class. Audrey met her husband, Fred, when they were both only 15 or 16 years old. He was an usher at the local theatre, which she frequented often. He joined the Air Force when he was 17, and served in England. He came home in from the war 1945; 1 year later, he and Audrey were married. They were 20 years old. As newly weds they couldn’t afford to buy a piano. But six years after they bought their first house, Fred bought Audrey a piano. Audrey and Fred were married 65 years. Unfortunately, he fell ill in 2012 and had to be hospitalized. Before he died, he asked Audrey to play Stardust, their song, for him on the piano in the nurses’ station. Through good times and bad, Audrey’s music is something that has always been with her. Today, her performances at Island Park delight many, but they don’t always go off without a hitch. During the holiday season, Audrey and three other residents had decided to each play three carols during the gathering. “I played my three songs that I was supposed to play. [One lady was held up, and] the other two ladies backed out — one didn't feel good and the other one was nervous. So now I'm up there and I'm thinking of every carol I know. Going through them, Silent Night, The First Noel, trying to think of them as I go along,” Audrey said with a laugh. Audrey also loves dancing, and took tap dancing when she was a young girl. She’s always up dancing with someone at events. Today, Audrey has four children, seven grandchildren, and 13 great-grandchildren.